Beautiful stone barn in stunning rural location on Dorset - Somerset border. Courtyard Barn at Lois Farm is perfect for holidays with your family or friends. If you are looking for relaxation and tranquillity in a peaceful rural setting overlooking farm land this lovely barn is for you. Situated in the beautiful Blackmore Vale on the border of Somerset and Dorset there are many well-known places to visit close by for all ages. We have horses and ponies with cattle and sheep in the fields during the summer. We are family friendly with baby equipment available to borrow, toys and a safe fenced garden. There is a large games room with table tennis and table football. In the colder months light the wood burner for cosy evenings in. The barn still retains many of the original features. 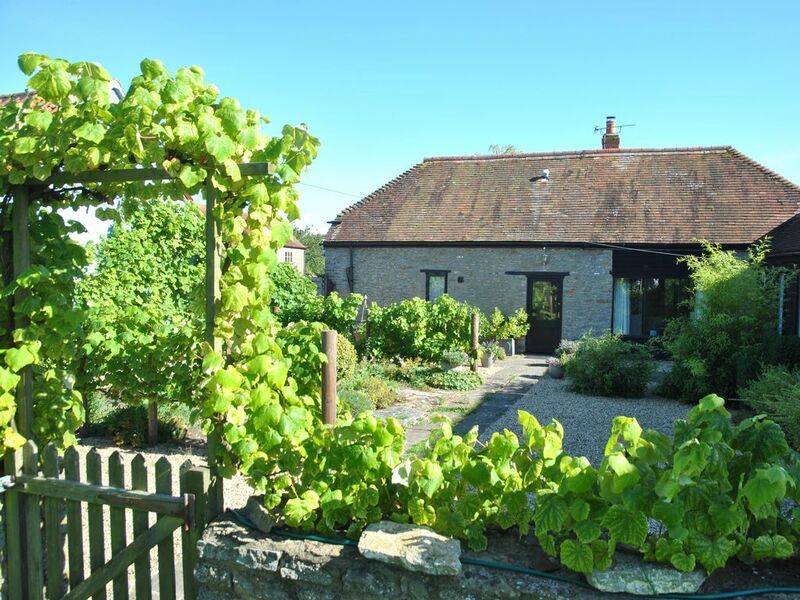 Lois Farm is located in the beautiful Blackmoor Vale on the border of Somerset and Dorset, accessed by a quiet country lane and surrounded by stunning countryside. We are only few miles south of Wincanton and ideally placed to visit many well-known attractions including Glastonbury, Longleat, Wookey Hole, Wells, Fleet Air Arm Museum, Hayes Motor Museum, Sherborne and many beautiful National Trust properties and gardens. The barn has recently been fully refurbished and will comfortably sleep 6 (plus cots) in three double bedrooms one of which is downstairs. All bedrooms have zip and link beds so can be set-up as either super kings or twins. We use only fine Egyptian cotton for linen and provide towels and bathrobes. The modern and well-equipped kitchen/diner has cream shaker-style units luxurious granite work surfaces and a slate floor. It is very well equipped including an American style fridge/freezer. The double doors open onto the patio with views over farmland. The lovely south facing patio and garden overlooking fields is ideal for al-fresco meals, relaxing in the evening sunshine and watching the sunset. In the winter the wood burner makes the living room a warm and cosy place to be, we provide all the logs and everything you need to light the fire. Upstairs there is a shared bathroom. There is a jack and jill shower room downstairs, this can be accessed from the downstairs bedroom as an en-suite or by a separate door for use by other guests. The generously sized living room has two three seater leather sofas and a 40 inch flat screen TV with DVD player. In the winter the wood burner makes the living room a warm and cosy place to be. The large modern kitchen is fitted with cream "shaker" style units with black granite work-tops and lovely slate flooring. It is very well equipped. Safe fenced south facing garden with plenty of garden furniture. 5 Star***** Four Adults, Three Nights Stay, to return again one day. We decided to have a long weekend away Friday to Monday. Wanted no more than a couple of hours drive from home, a barn conversion, wood burner, peace and quiet, and somewhere scenic. Found Courtyard Barn, it has the aforementioned, and more. The drive was pretty, and straightforward, the barn has the scenery, and is so very peaceful. Set within Lois Farm. It has privacy and lovely views at the back of the property over fields and open skies. On arrival, Tanya greeted us and kindly gave us a tour. It felt so homely, super clean, light & bright, fresh flowers were a nice touch, beautifully furnished with three spacious bedrooms two bathrooms. Our trip was to give my folks a change of scenery, and to celebrate mums 75th birthday. I enjoyed the kitchen/diner as a room, super views and sunsets, preparing & cooking supper with every kitchen utensil and gadget to hand. The radio was most welcome too, Thank you. Being here in January, we made good use of the wood burning stove and it was easy to get going and kept our toes toastie. I had not realised until leaving on the Monday, how relaxed I felt. Personally I had slept so soundly, the beds just perfect in size, the quality bed linen, and the peaceful location. The owners Tanya and Chris have made this home from home, they are friendly, helpful and thoughtful. We drove away feeling somewhat sad, as we all said that we could have stayed longer and that we would like to return, perhaps in the warmer weather. It is worthy of its 5 stars and it has been decorated and furnished to a high standard. The four of us had a very enjoyable and most memorable stay. Thank you so much for your very kind review. It was a pleasure to have you stay here at Lois Farm with us. I am so pleased you left feeling relaxed and well rested. I am glad you liked the barn and you found it had everything you needed. We would be delighted to welcome you back to Courtyard Barn, if it was warmer your Mum could visit Humphrey more often without getting cold. The cottage is in a very quiet location backing onto fields with its own private garden. Everything inside was immaculately clean and tidy, no sticky glasses or cutlery! The hosts were very friendly and helpful. We had great weather and the barn really did look as good as it does in the photos. Handy for the stunning Stourhead National Trust property. Overall it was a great place to spend a relaxing weekend. Thank you Andy for your very kind review of Courtyard Barn. I am so pleased you liked the barn and had an enjoyable and relaxing weekend. It was a pleasure to share Lois Farm with you and thank you for being such lovely guests. It would be a pleasure to welcome you all back if you needed another weekend away to relax. I hope you enjoy the rest of your summer.